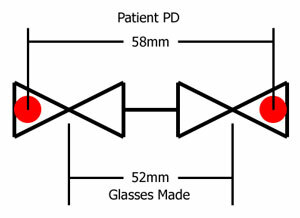 Ophthalmic Lenses: How to create a prismatic prescription through decentration! How to create a prismatic prescription through decentration! To better understand why there is induced prism, the cross-section of a plus lens can be likened to two prisms base-to-base, as the lens is thicker in the middle and thinner at the edges. Likewise, a minus lens can be likened to two prisms apex-to-apex, thinner in the middle and thicker at the edges. This induced prism can actually be used to the advantage of the lab when prism is called for in a prescription. If the lens power is sufficient, to induce the prescribed prism, the lens can simply be cut off-center to achieve the required results. This is known as prism by decentration. If the power is insufficient(if less than 1D), however, the prism must be cut into the surface of the lens. A simple equation can be used to calculate the prism induced by decentration. Prentice’s rule states that prism in diopters (Δ) is equal to the decentration distance (c) in centimeters multiplied by the lens power (D). We can create a prismatic prescription through decentration using a finished uncut, thereby avoiding the time and expense of having to grind the Rx from a semi-finished blank. This gives you the decentration in mm. Important thing to remember: Prentice’s Rule breaks down for ophthalmic lens powers of less than about ± 1.00diopter. Simply put, if you have a plus lens decentration goes with it. While in a minus lens, decentration goes against it. Hey if prescription is only hv cylinder power.. Then? Why AR Coating on the back surface of sunlenses!